Students are an intrinsic part of the information sharing process. They can reflect on their learning and be involved in a number of ways. Students can reflect on their learning as part of the school’s written reporting process. Students could write a letter to their parents or complete a template to insert into the report. 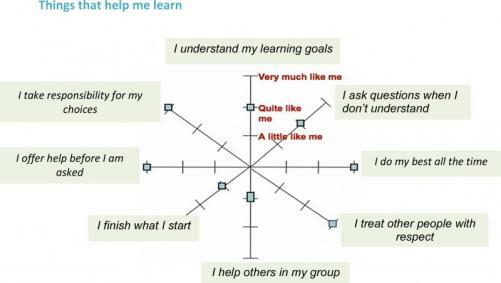 Students could complete six-monthly self-assessments that are related to their important learning goals. They could develop criteria with the teacher and then assess themselves at two time points using a tool such as the one below. These assessments could also be shared with parents during student-led conferences, through portfolios or through inserting them into written reports. Download a template of this diagram here.